Scenes from a Hindus for Trump rally in New Jersey. 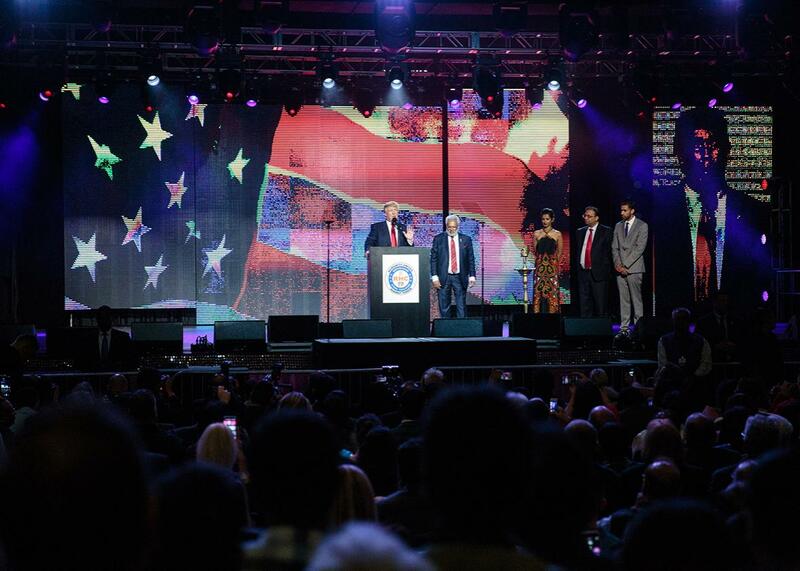 Inside an Indian American rally for the divisive Republican presidential nominee. 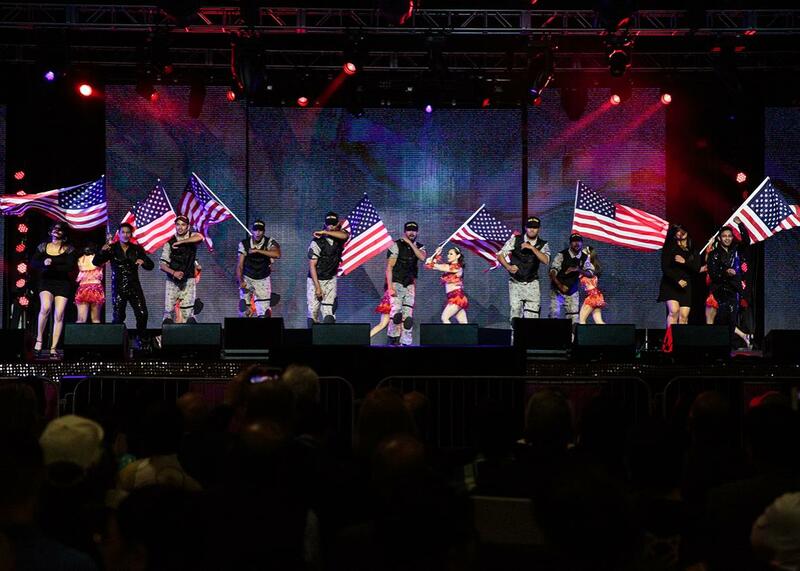 The Hindus United Against Terror Charity Concert on Saturday in Edison, New Jersey, featured a Bollywood-style depiction of a terror attack. Prasanna Prashad is watching a dance performance inside the New Jersey Exposition and Convention Center on Saturday while eating a plate of pav bhaji, a Mumbai street snack. Two couples dancing onstage abruptly come to a stop. Two men wearing thobes, a traditional Arab garment, suddenly burst in carrying laser-beam guns and begin spraying imaginary bullets. A troop of prancing men in SWAT vests emerges, cartwheeling, shooting, and pummeling until the “terrorists” fall. Then, the soldiers and their freed hostages line up, hands on their hearts, and adopt solemn expressions as “The Star-Spangled Banner” begins to play. Prashad, who grew up in Hyderabad, a south Indian city, is growing anxious. She’s been waiting three hours to see Ram Charan, an actor from “Tollywood,” a film industry based in the south Indian states of Telangana and Andhra Pradesh. She did not particularly care that the event she was attending, the Hindus United Against Terror Charity Concert, was actually a Tollywood-Bollywood spectacle to promote Donald Trump. “We came for the entertainment,” she says. Her 10-year-old son, in a brocade Nehru jacket, is curled up in the seat next to hers. “We don’t have evening plans so maybe we will have dinner here.” In one corner of the room, Bollywood Flavors caterers are preparing a spread of Indian food interspersed with tumblers of mango lassi. Kumar, an electronics business tycoon from Chicago who goes by the nickname Shalli and likes to wear suits embroidered with his own initials, is one of Trump’s leading financial backers, having contributed roughly $900,000 to the Republican presidential nominee’s campaign. Indian Americans are the second-largest and fastest-growing immigrant group in the country but have traditionally not been viewed as an influential voting bloc. Typically, both Hindu Americans and Indian Americans are seen as reliable Democratic voters. The 2012 National Asian American Survey showed Asian Indians as among the top Asian American subgroups most likely to identify with the Democratic Party. This year’s survey shows their party lines remain about the same, although alignment with the Republican Party has inched up slightly—from 3 percent to 7 percent. “I grew up admiring JFK. His pictures used to be plastered all over town as the most handsome president of the United States ever,” Kumar says at the event. He says he began to move toward the right after a chance meeting with Ronald Reagan in 1979. “He convinced me that my values were conservative, and I became perhaps the first Republican Indian American in the country,” Kumar says. Weightman identifies with Trump, he says, because he is a strong father figure. His own father died in a car accident when he was young. “I had to take charge,” he says. “That’s what I see in this man. I see my father in Donald Trump. I see Archie Bunker,” he says. Donald Trump spoke about four hours into the rally Saturday. “I am a big fan of Hindu,” he told the crowd. He promises to help lower taxes for small businesses and to repeal and replace “job-killing” Obamacare. Cellphone cameras are whipped out, and little children are hoisted on shoulders. One Indian aunty is using a poster that reads “Trump Great for Hindu Americans” to protect her feet from frenzied selfie-takers. “Indians see firsthand the brutality of terrorism and cross-border violence, including the attacks in Bombay—and I mean, look, Mumbai is a place that I love,” Trump declares. “It’s a place that I understand. So, for all of the people in Mumbai, the attack on Indian parliament—absolutely outrageous and terrible,” he says, apparently conflating the 2008 terror attacks in Mumbai with a 2001 terrorist attack on Parliament that actually took place in New Delhi, India’s capital. The terror threat was the night’s theme. Earlier that evening, Raju Bhatija, who owns a travel agency in Manhattan, was holding a poster that depicted Hillary Clinton with horns growing out of her head, angrily pointing at Indian Prime Minister Narendra Modi, wearing blood-soaked clothes and looking genuinely scared. Reporting for this story was supported by the South Asian Journalists Association.